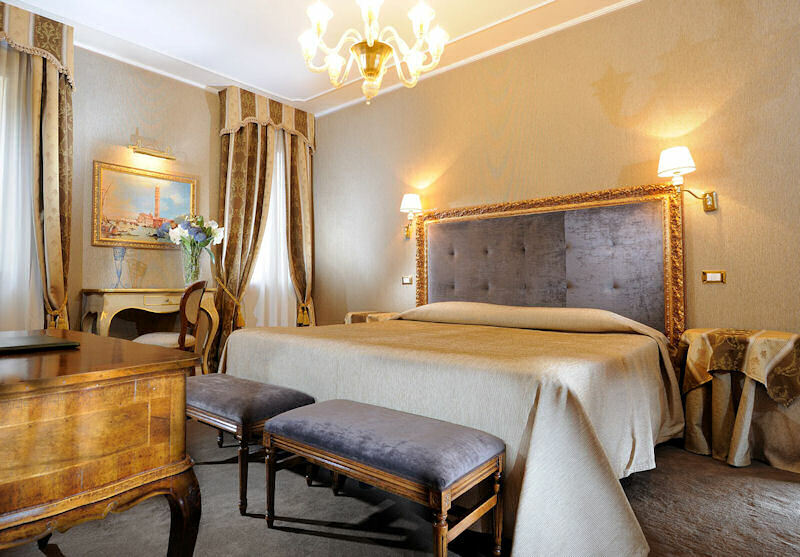 A few steps from St. Mark’s Square, the heart of Venice, discover an elegant and romantic hotel located along a canal… Welcome to Ca’ dei Conti a 4 Star Hotel in Venice! This historic house is located in a picturesque area of “the Serenissima”, close to one of the oldest churches in Venice (Chiesa di Santa Maria Formosa), the Foundation Querini Stampalia and the famous Bridge of Sighs. Nearby, in the Castello district, the Riva degli Schiavoni is a pleasant walk, which extends along the San Marco basin, it is lined with loading docks to the islands of the lagoon (Murano, Burano and Torcello). The rooms of the Hotel Ca’ dei Conti are a reflection of 18th century Venice, luxurious and refined, decorated with Venetian style furniture with a dominance of colors blue, green and gold. They are equipped with all modern comfort such as telephone, minibar, satellite TV, radio, personal safe and individual air conditioning.